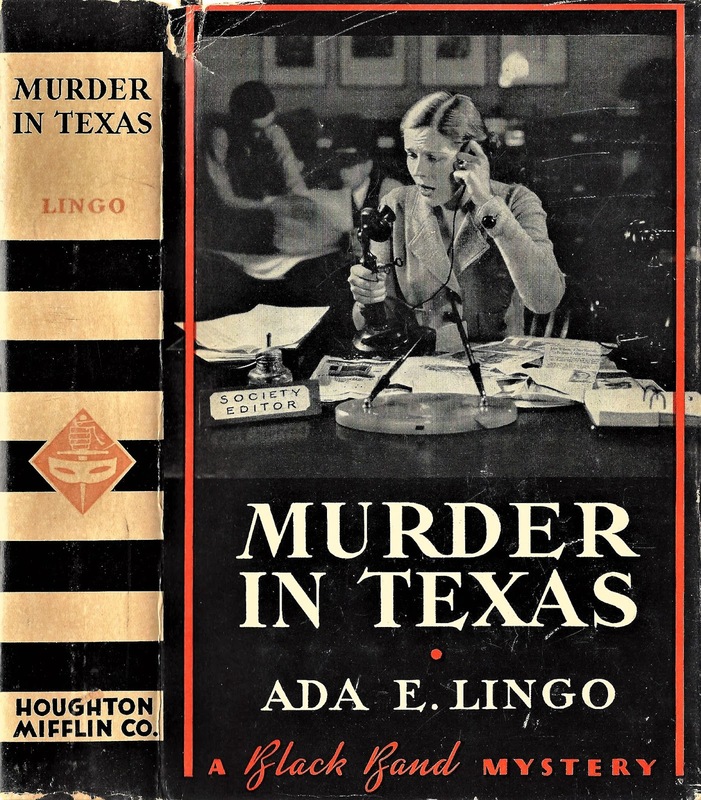 Ada Emma Lingo published only one detective novel, Murder in Texas (1935), but the novel, now reprinted by Coachwhip after over eight decades, stands as an interesting and enjoyable example of the American regional mystery from the period between the two world wars. Born in Fort Worth, Texas in 1908, Ada Lingo spent half of her years up to the age of ten in Oakdale, Louisiana, where her father, David Clayton Lingo, worked for the Oakdale Ice and Light Company. After her mother, May Evans Lingo, died in Oakdale in 1919 (possibly a victim of the flu pandemic), Ada, an only child, was sent by her salesman father to live with relatives: first in Highland Park, near Dallas, where she resided with May's twin sister, Daisy Evans Lockart, Daisy's husband, James, and the couple's son, Ada's cousin Jimmy; then May's widowed mother, the thrice-wed Ada Manning Price Desel Evans, and May's half-brother Reuben L. Price, an officer in the First National Bank of Big Spring, Texas, a then booming oil town on the Great Plains. The red-haired Ada, who was nicknamed "Rusty," proved a gifted athlete, excelling in swimming and tennis, and an outstanding scholar. 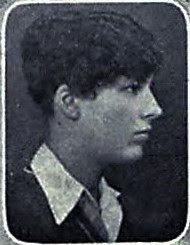 After graduating from Big Spring High School she received degrees in journalism from the College of Industrial Arts (later the Texas State College for Women and now Texas Women's University) and the University of Missouri and got a job with the New York World, Joseph Pulitzer's legendary newspaper. The paper folded in 1931, but the same year Ada married Charles Trabue Hatcher, a University of Virginia graduate and electrical engineer eleven years Ada's senior. Ada gave birth to the couple's daughter the next year, but the marriage soon fell apart, and Ada moved back to Big Spring with her child. The couple divorced later in the decade. 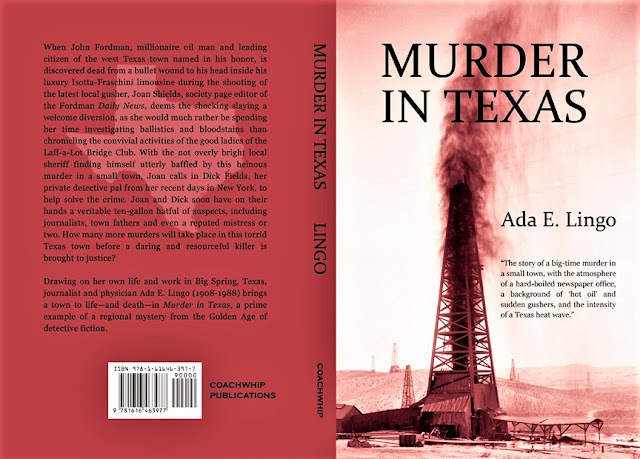 Back in Big Spring Ada worked as Society Editor for the local newspaper, the Daily Herald, while writing her sole published detective novel, Murder in Texas. In the fall of 1934 she enrolled in the pre-med program at Baylor University and between her completion of the program in the spring of 1935 and her enrollment at the Texas University Medical School in the fall she produced, as per her contract with the publisher of her first novel Houghton, Mifflin, a second detective novel manuscript, Murder by Minims, set at the mountain resort town of Ruidoso, New Mexico and reflecting her new medical training. Although her cousin Jimmy apparently read the second novel, it was not published and the fate of the manuscript is unknown. After obtaining her medical degree Ada interned in Los Angeles. There during World War 2 she started her own practice, winning a prominent reputation in southern California as a cancer specialist. In LA she lived at a large house with a swimming pool and tennis court, allowing her conveniently to indulge her athleticism. Later in life she would settle in Olympia, Washington, where she would pass away at the age of 79 in 1988. Twenty years later a granddaughter recalled Ada as "a family doctor, writer, environmentalist, animal lover, techno geek, and photographer," who "was also a lesbian." Ada's Texas first cousin, once removed, Jim Lockart, to me recalled his cousin as "brilliant." There is a smell of oil and the breathlessness of Southern Summer throughout this Texas tale. There is, also, the atmosphere of a singularly unpleasant small town, and, particularly, of the small town's newspaper office, whose society editor is the novel's heroine. The Big Spring Daily Herald, although not perceiving the town in Murder in Texas, which was based on Big Spring, as unpleasant, let alone singularly so, declared that the novel would "make the swellest Christmas present that one Big Spring person could give to another" and predicted that "Fitting the characters to people in town will be great indoor sport for those who read the book, for many months to come." 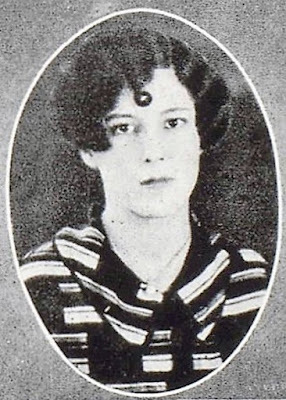 Ada Lingo claimed that all of the characters in the novel had been drawn entirely from her own imagination, but the Daily Herald genially scoffed, "They say that all writers have to do this." 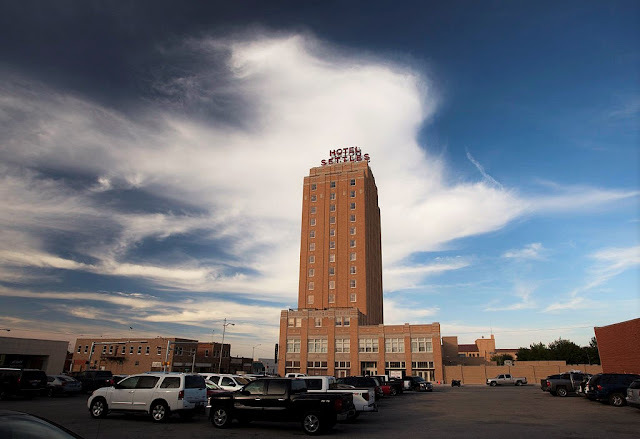 In my introduction to the novel I identify buildings and people drawn from Big Spring in Lingo's setting of "Fordman," such as the Hotel Settles, still the most prominent architectural landmark in Big Spring today. This is an interesting aspect of the novel (especially if you are from Big Spring), but the appeal of the novel goes beyond the identification game. 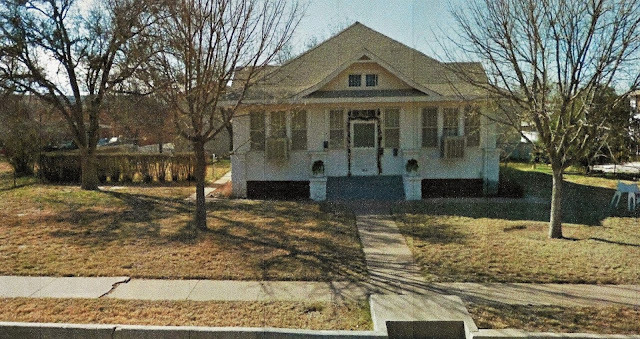 Murder in Texas concerns the murder of Fordman's "Great Man," oil tycoon and newspaper owner John Fordman (for whom the town has been named). When the novel opens Fordman is discovered dead from a bullet wound to the head inside his luxury Isotta-Fraschini limousine, during the shooting of the latest local gusher. 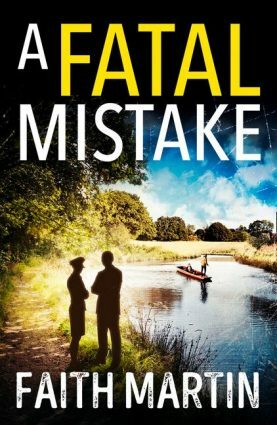 Joan Shields, Society Editor of the Fordman Daily News, bored with regaling the town with the latest thrilling doings of local bridge clubs, looks into the murder; and, the local sheriff not being very bright, she brings into the case Richard Fields, her private detective pal from New York. It's a tough case to crack, what with the suspects in the crime including town fathers, local journalists and even a discarded mistress or two. John Fordman, it seems, had quite a few skeletons in his spacious closets. In the introduction to Murder in Texas, I include a lot of detail about Ada's fascinating family history. On her father's side Ada was descended from Pennsylvania Quakers (indeed she and my grandfather were seventh cousins, which I hope hasn't biased me in her favor! ), while on her mother's side, the southern side, she was kin to antebellum Alabama planters turned post-bellum frontier shootists. 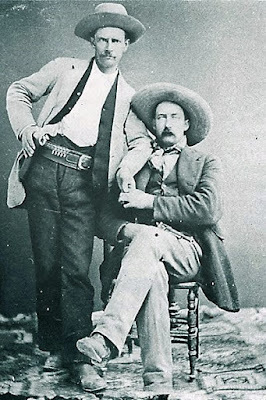 The Manning boys of El Paso, Ada's great uncles (including Felix "Doc" Manning), were involved in the killing of Marshall Dallas Stoudenmire in 1882, less than a year after the more famous Gunfight at the O. K. Corral. Additionally a great-great uncle of Ada's was killed by his ill-treated wife, a daughter of a pioneering southern feminist who later became one of New York's first female physicians. Murder, medicine and moxie seem to have been in the family blood!